Cognitive behavioral therapy works well as a PTSD treatment, but as many as a third of those afflicted with the disorder will go on to experience a chronic course and need ongoing care. 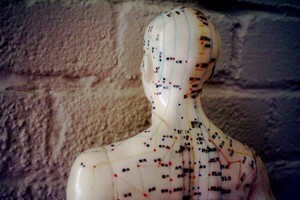 Some of these people may go one to find relief through an unexpected treatment – the ancient Chinese art of acupuncture. Acupuncture is now a National Institute of Health (NIH) endorsed complementary therapy for a range of conditions and there is some strong evidence that the technique may work very well for those with PTSD. One study which provides strong preliminary evidence of acupuncture's utility as a PTSD treatment comes from researchers at University of Louisville School of Medicine, who compared the effectiveness of acupuncture to cognitive behavioral therapy and to no treatment on a group of study subjects all suffering with PTSD. The researchers measured changes in anxiety, depression and overall impairment. 73 study subjects with PTSD were randomly assigned to one of three control groups, subjects in one group received no treatment, subjects in a second group received 12 weeks of group cognitive behavioral therapy and study subjects in a third group received 12 weeks of acupuncture. 12 weeks of acupuncture and provided symptoms relief equal to 12 weeks of group cognitive behavioral therapy. Both of these treatments provided greater symptoms relief than no treatment. Symptoms relief endured for subjects in both the acupuncture and group CBT groups endured for at least 3 months post intervention.